Joel is a practitioner and researcher with background in photography technology, specialized in creative uses of integrating photography and interactive technologies. 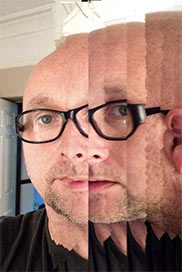 As a practitioner he has participated in a number of international festivals, TodaysArt (Netherlands) FutureEverything (UK), Mai de la Photo (France). His current PhD research explores fears and perceptions of collective shared public data. Before joining the Creative Exchange he studied Media Arts at Manchester Metropolitan University within MIRIAD (Manchester Institute for Research and Innovation in Art and Design) after studying Photography at West Surrey College of Art and Design. Previous work includes Ubiquitous Interactivity exhibited in the group show POI: Moving, Mapping, Memory at the Cornerhouse Manchester where radio frequency card (RFID) technology to generate images based on hidden card data. By swiping your card (ID card, Biometric passport, Oyster card) over a card reader, a unique image is generated from the hidden numbers embedded in the card's microchip. Other works have also investigated the use of Bluetooth wireless technology to produce an interactive environment controlled by an unaware public audience. Other photographic works shown during the group show ‘The World is my Imagination’ at CUBE gallery Manchester in 2007 investigate the perception of the countryside and the visitor experience. How do we define identity in the digital public space?